regarding Advisor's features and screen shots of the program. broken down by disability, or student lists/counts by college major are examples. forms and reports can be produced. texts (CD, tape, enlarged print etc). A complete checkout system is included. 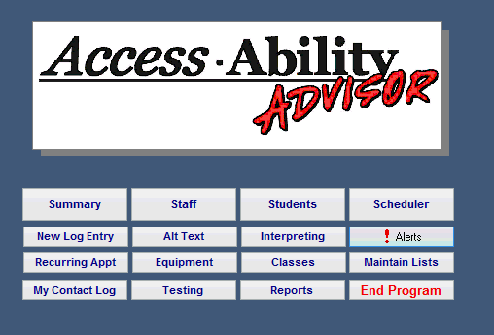 ad hoc reports can be created using Access reporting functions. which allows use of course schedules, student data and performance history through ODBC links with Banner Views.